The fairandfunky Sustainable Schools Conference, held at IMWS Centre in Batley, welcomed schools from across Yorkshire to learn about local and global sustainability in creative workshops from Grow To School, Pockets Theatre, LoveBread CIC and fairandfunky; giving lots of ideas and inspiration to take back to school and take action! All fairandfunky workshops and events empower people to take their own little steps to change the world and encourage people to think about the world around them: locally and globally. The Sustainable Schools Conference looked at topics from the Eco-Schools programme to do this. Conference delegates first discovered the topic of waste – did you know 60% of all household rubbish can be recycled? 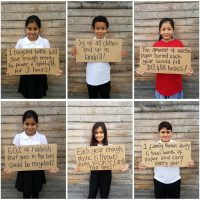 Together we discussed what to do with our household rubbish – should it be recycled, reused, upcycled or thrown away? Children had lots of brilliant suggestions when challenged ‘Don’t throw it away, make something!’ Each child then took part in four different workshops – each reflecting a different element of Eco-Schools doorways, each workshop providing evidence for the schools to progress on their eco-schools journey. 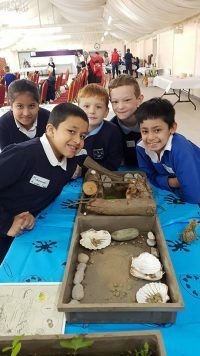 With Grow To School children explored the wonderful array of habitats on our doorsteps and created their own miniature ponds to replicate at school – demonstrating that even small things are great for biodiversity! Each school also made a seaweed pod to take back to their school ponds to encourage wildlife. In the fairandfunky workshop on recycling students used recycled bits of card, egg boxes and old packaging to make egg box wreaths. Did you know the average family uses 6 trees worth of paper every year? Delegates learnt the importance of reducing paper consumption and to look for recycled products when buying new. The LoveBread ‘Flour Power’ workshop on food sustainability was very popular as everyone got the opportunity to knead dough and taste bread! 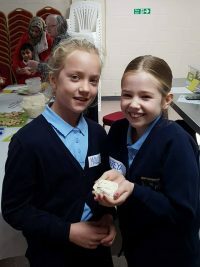 Delegates discovered the ingredients used to make bread – for many children this was a new discovery. The knowledge they could make their own bread was very exciting! Citizenship was the focus for Pockets Theatre. Students became leaders of an imaginary town, making important planning decisions that would affect residents, businesses and the environment. The conference closed with certificate presentations from Tracy Brabin MP, who was delighted to see so many schools engaging with sustainability and children who care about the planet. “It was an inspirational conference with high quality activities, really well organised and full of happy and enthusiastic pupils. 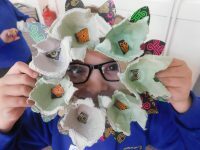 We’re going back to school with lots of new ideas!” Northowram Primary School. Thank you to all workshop providers for their brilliant sessions, to Fairtrade Batley and Spen for helping on the day and to Tropical Wholefoods, Suma Wholefoods and Seedball for sponsoring the Sustainable School goody bags!